The Sustainable Business Awards recipients were honored at the annual gala. 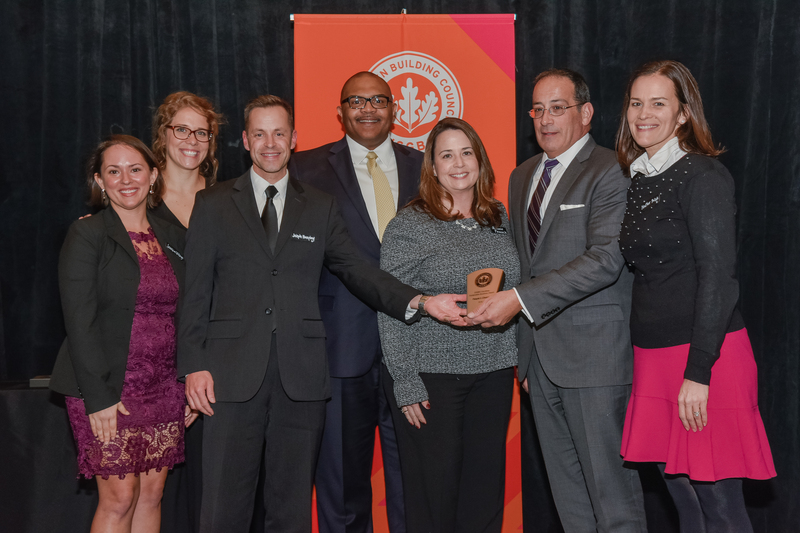 On November 28, the seventh annual Green Gala brought together more than two hundred green building advocates from across the USGBC North Carolina and USGBC South Carolina communities to celebrate the rapidly growing green building movement in the region. From across the Carolinas, local leaders are collectively working toward greater resiliency and sustainability in our communities through green buildings, and the Green Gala gives us the opportunity to celebrate our collective successes, while recognizing individual leadership and contributions. A feature of the Green Gala was the Sustainable Business Awards, which highlight the people and projects that are transforming the built environment every day in North and South Carolina. Award winners were selected due to their leadership in the green building movement, and for their participation in LEED. Community Champion: Jewish Studies Center Addition, Charleston, S.C. The LEED Gold addition to the center incorporates the latest smart technology and innovations in all classrooms, as well as integrating water- and energy-saving tactics, sustainable building materials, natural lighting, kosher/vegan/vegetarian food options and compostable dishware and cutlery. Innovative Project—Building Design and Construction: Sealed Air Global Corporation Headquarters, Charlotte, N.C.: The Sealed Air Global Corporate Headquarters campus, which consists of three LEED Gold buildings, implemented four overarching strategies that made the new Sealed Air campus a remarkable example of highly innovative design: open space and tree preservation; alternative transportation options; zero waste campus initiatives; and occupant access to daylight, views and lighting controls. Innovative Project—Interior Design and Construction: 109845 Brigham Building, Charlotte, N.C.: The LEED Gold Brigham Building is an example of innovative design for the interior of a building space. The project owners sought to create an engaging workplace environment that was both flexible and comfortable, increasing employee productivity by deploying a range of innovative workplace spaces such as collaborative areas, break rooms and focus rooms. Marquee Green Building: Charter Square, Raleigh, N.C.: Charter Square, an 11-story, LEED Platinum building, provided a dramatic addition to the Raleigh skyline. The building incorporated a significant energy efficiency measures, responsible use of resources, recycling and reclamation of materials and improved indoor air quality and now provides a healthy working environment, making Charter Square one of the most innovative and significant sustainable buildings in the Carolinas. Community Change Agent—Professional Services: Moseley Architects, with offices across the Carolinas: With a nearly 20-year history of promoting sustainable design, a diverse portfolio of LEED projects and a strong commitment to sustainability, Moseley Architects has positioned itself as a Community Change Agent that is dedicated to USGBC’s mission of transforming the way buildings and communities are designed, built and operated. Community Change Agent—Community Development: Alex Andrews, Dominion Realty Partners LLC, Raleigh, N.C.: Under the leadership of Alex Andrews, CEO of DRP, the firm played a major role in actively changing Raleigh’s downtown skyline, therefore becoming an important part of this year’s Marquee Green Building-winning project, Charter Square. Volunteer Leadership Award: Lauren McDowell, Barringer Construction, Charlotte, N.C.: As a project coordinator with Barringer Construction, Lauren McDowell has led dozens of projects through the LEED certification process, bringing together her love of construction and community service. She works with Habitat for Humanity, ensuring every home is built to LEED Silver standards, and is actively involved in youth volunteer programs for disadvantaged kids and children facing life-altering illness. People’s Choice Award: Charlotte Mecklenburg Police Department Westover Division Station, Charlotte, N.C.: The Charlotte Mecklenburg Police Department Westover Division Station, one of the first LEED v4 projects in North Carolina, was voted by attendees at the gala as the People’s Choice winner. The project incorporated the community’s involvement throughout the design of the building, taking feedback and ideas at public meetings and installing a community-built art installment at the building’s entrance. Congratulations to all the award winners and to the leaders helping make the North and South Carolina region one of the fastest-growing places for LEED in the country.